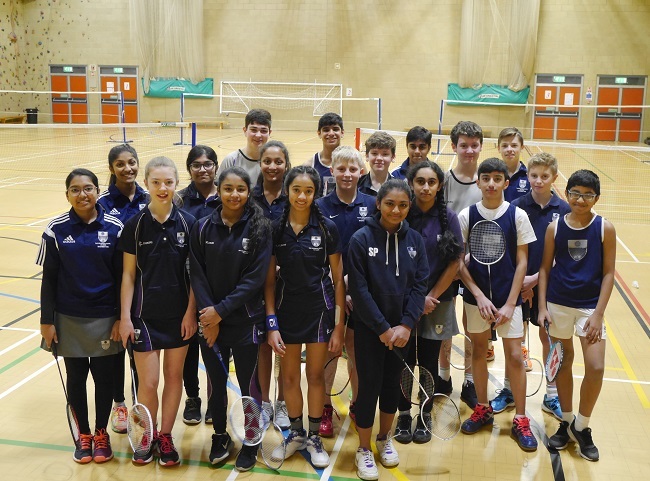 The Grammar School at Leeds (GSAL) hosted the top badminton schools in West Yorkshire this week in the county round of Badminton England’s National Schools Championship. Twenty-two teams from nine schools across West Yorkshire competed, hoping for the chance to progress to the regional round, which is the semi-final of the national championship. The championships culminate in a national finals weekend in May at the National Badminton Centre in Milton Keynes. GSAL fielded teams in all four categories at the West Yorkshire round, with three teams ending the day as county champions. The three successful teams will compete in the next round for a chance to reach the national final. The KS3 girls smashed their way to victory beating all the opposition teams from Wakefield Girls, Beckfoot and Shelley. They won all their matches and only dropped only one game out of 15. The KS4 girls displayed superior qualities over Shelley and Rishworth, winning all their matches without dropping a single game. There was an equally impressive win for the KS4 boys, who overwhelmed the opposition. They topped their pool after winning matches against Beckfoot, Heckmondwike Grammar School and North Huddersfield, then smashed their way to the championship by defeating Rishworth in the play-offs. They only dropped one game out of twenty. The KS3 boys also came top of their pool, but finished the day as runners up, after losing the play-off to a very competitive Heckmondwike team. Dr Faisal Motashar, who coaches GSAL’s badminton teams, said: “I am impressed with our students’ talent, tenacity and commitment. It was a demanding and exhausting day for everyone, however it’s brought me much pleasure and pride to support our players in their endeavours.